West Palm Beach, FL – The South Florida Water Management District (SFWMD) Governing Board today approved a cooperative agreement with Miami-Dade County that allows for use of county lands to support SFWMD's ongoing investment in restoring Biscayne Bay. "Biscayne Bay is a critical ecosystem in Miami-Dade County, and this Governing Board is doing everything in its power along with partners such as Miami-Dade County to restore this beautiful natural jewel," said SFWMD Governing Board member Federico Fernandez. "We are so thankful that our partners with the county certified these lands for use in the Biscayne Bay Coastal Wetlands Restoration Project. Together, we will help get this project done." 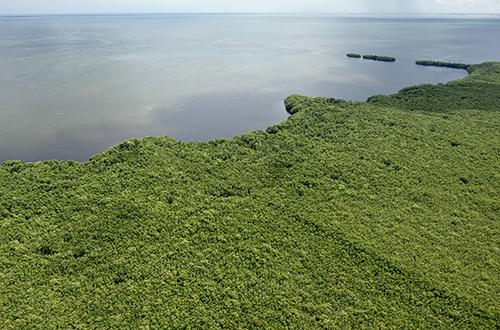 Under the cooperative agreement with Miami-Dade County approved by the Governing Board, the county certifies land it owns in the Deering Estate and L-31 Flow-way areas of the Biscayne Bay Coastal Wetlands project footprint for use in project restoration features. The county retains ownership of the land but agrees that it will not be used or encumbered for any purpose other than the restoration project.